One of the great things about Luray is the location. 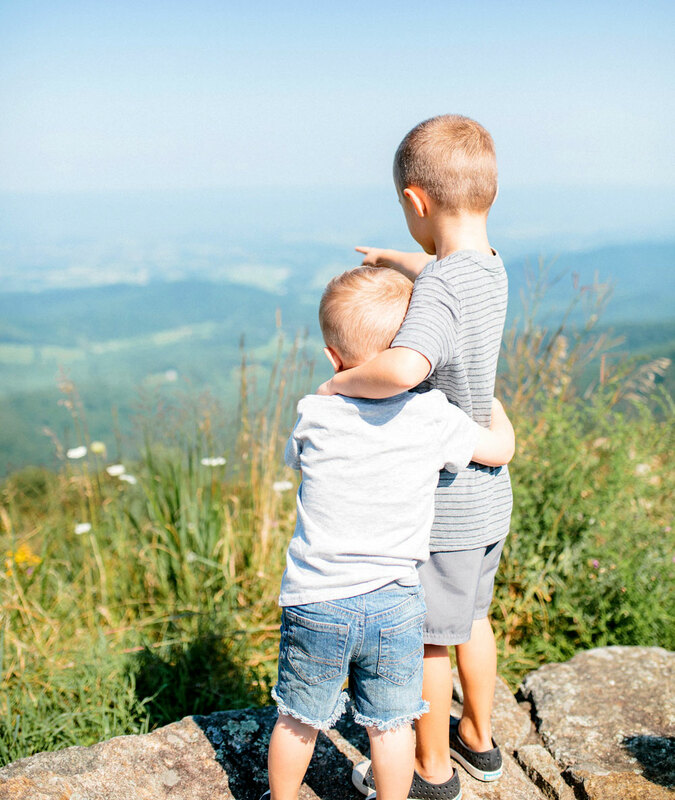 You have super easy access to Shenandoah National Park, which is perfect if you’re looking to go hiking, take in a breathtaking view, or have two little boys obsessed with going into the woods and finding “creepy crawlies”. 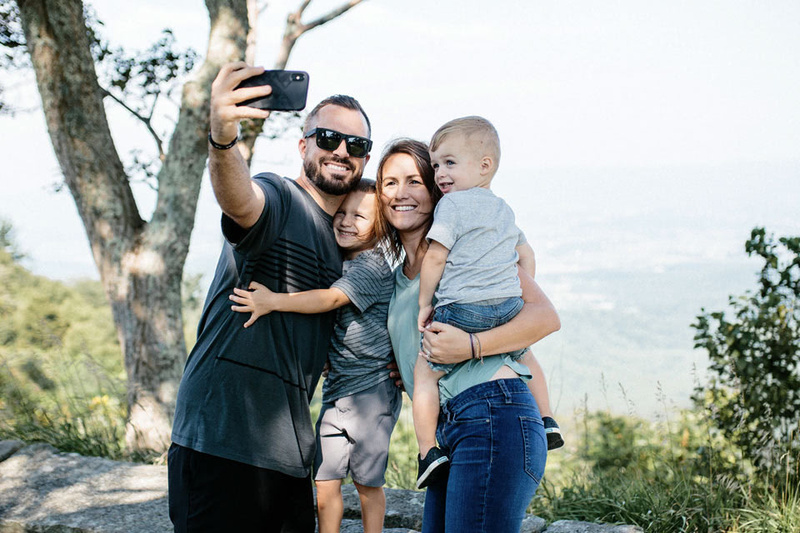 So, after breakfast we hopped in the car and headed to Skyline Drive to take in the beautiful views of the Shenandoah and look for a good place to adventure. After passing a few different overlooks, we decided to stop at Stony Man Overlook which had a bigger parking lot and a path into the mountains. When we got out of the car it was still a cool-ish summer morning. By the time we reached the top, the summer heat we had been having was kicking in. I was so thankful the path we took was shaded. 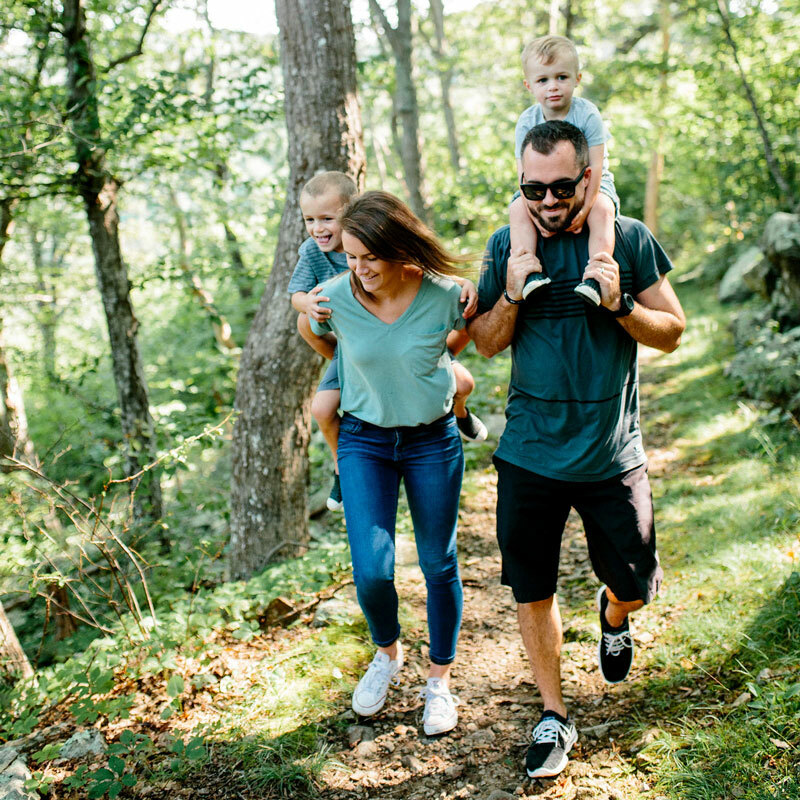 Look at these beautiful people enjoying the great outdoors. The boys found plenty of creepy crawlies and there were a ton of butterflies to chase around. A TON! At the top, they really enjoyed walking along the ledge (with me close by of course), looking out over the valley, and taking in the cool breeze that was blowing. I don’t think you really can go wrong on picking a path along Skyline Drive. The whole area is so beautiful, you can start anywhere and just walk until you’re happy where you wind up. On the way back into town, we stopped to get some more outdoors time at the Luray-Hawksbill Greenway Trail. It’s a fantastic multi-use path that follows along Hawksbill Creek and runs through the center of Luray. It really gives Luray a touch of character that makes it such a fun little town. There are a bunch of murals to see as well as the more natural works of art – flowers. So many beautiful flowers! While walking we came across a crazy amount of ducks. SO MANY! 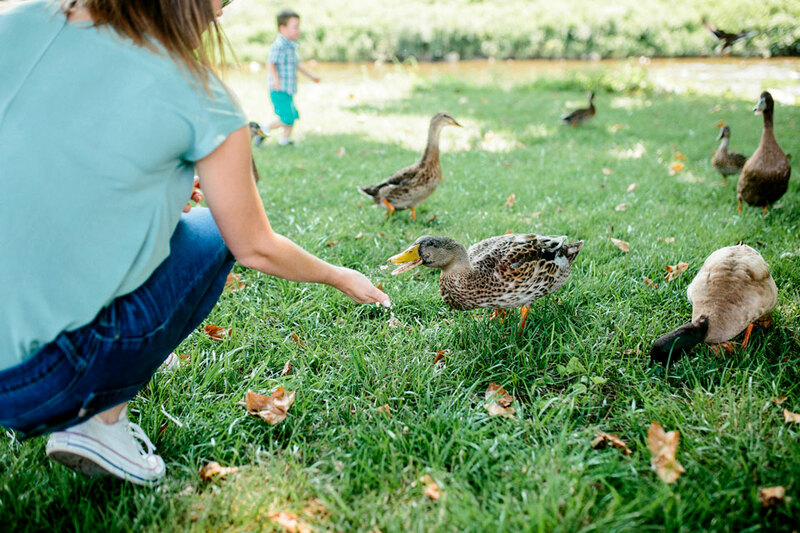 There was a local couple there with a HUGE bucket of bird feed and they let the boys take their turns feeding the ducks. Some loved it. Some were a little scared (me). Chris also took the boys out in the creek to play on the rocks and cool off a little bit. There were some incidents of splashing, but no tears were sighted. Just a bit off the Greenway is the Warehouse Art Gallery. As you probably guessed from the name, it is in an old warehouse that has art in it and, side note, is way bigger than I thought it was going to be. 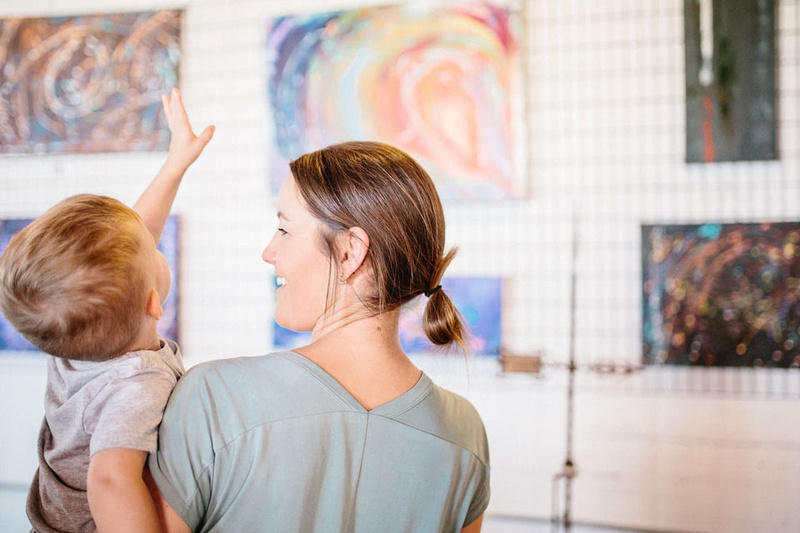 If you’ve never tried taking young children into an art gallery, it can be pretty hit or miss. 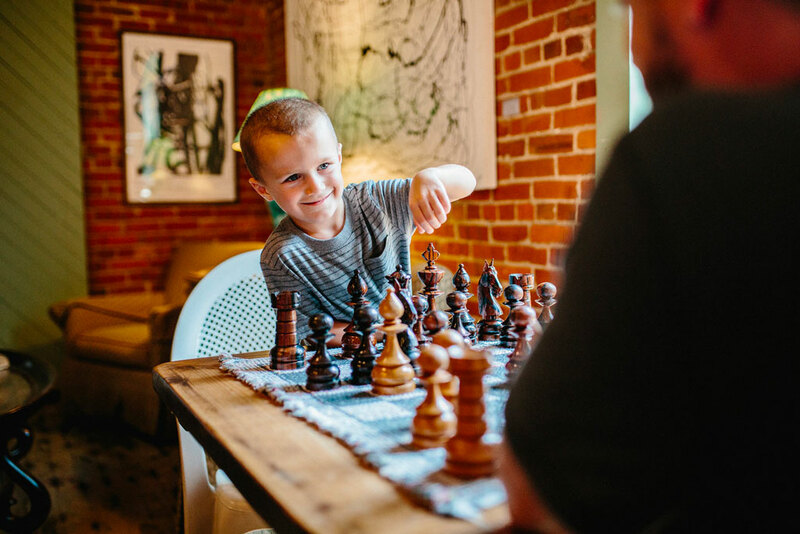 This art gallery has such a variety of art that the boys actually really enjoyed the whole experience and were plenty entertained. So that’s a win. There’re paintings, sculptures, photography, jewelry, pottery, and pretty much anything you can think of (and some you couldn’t). It’s bright, open, and fun and they have over 1,000 creative works by 90 regional artists on display. Battle of the Century: Chris vs Christian. We were only there for a little bit, but they say they switch out the art fairly often. You never know what you’ll find on any given day. The way they have the museum laid out and setup is really neat, as in interesting. It’s also really clean and very well organized. There was even a model train running along the inside. The boys LOVED it. Each time it came back around it was like they were seeing it for the very first time. After we went through the museum, we went out back to where the actual train track is, hoping to see one up close. Unfortunately, none went by while we were there. This was a cute little shop that you would 100% assume you’d find in a small town like Luray. It had that small town, antiquey, eclectic feel and I LOVED IT! 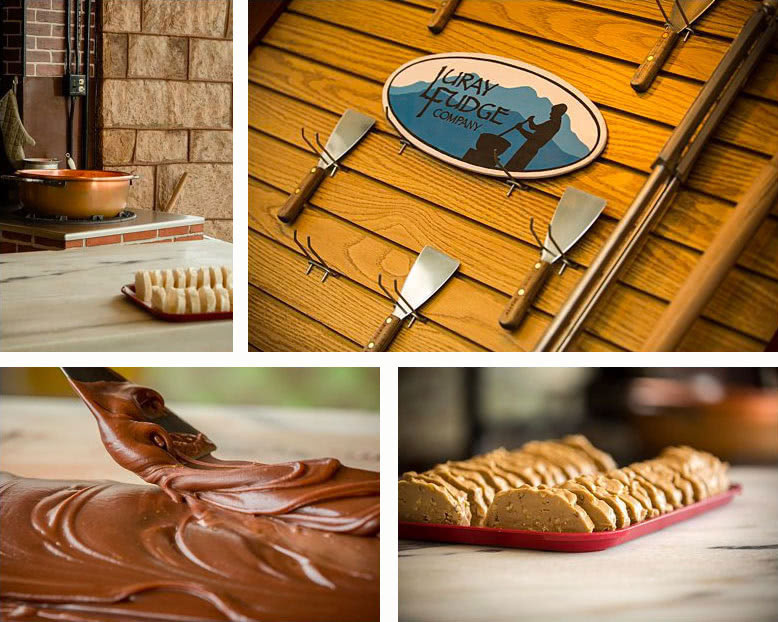 What’s really cool about Hawksbill Trading is that it is a vendor-owned cooperative, all from Luray. So it’s kind of a small business made up of smaller businesses, which is so cool. 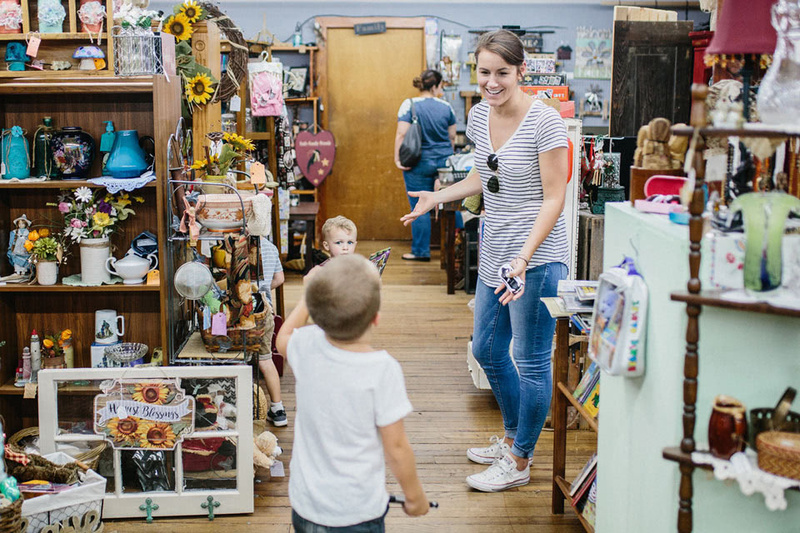 They offer arts and crafts, produce and baked goods, accessories, gifts, home décor, and antiques. All under one roof. And all of it amazing. 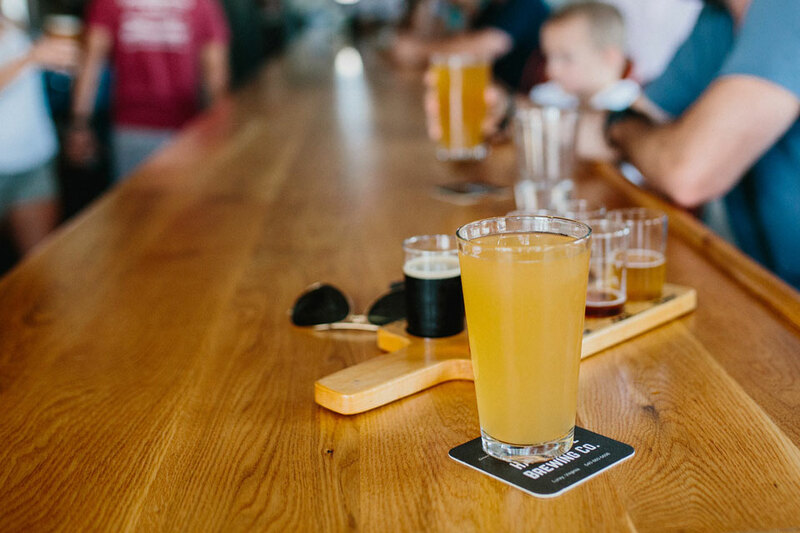 We were interested in trying some of the local craft beer so we stopped at Hawksbill Brewing Company, conveniently located off the Greenway, to cool off for a bit. Hawksbill Brewing Company not only brews their beer locally, but nearly all of the ingredients are grown in Luray as well. I don’t know for sure if that is what makes the beer absolutely delicious, but I am going to go ahead and say it does. 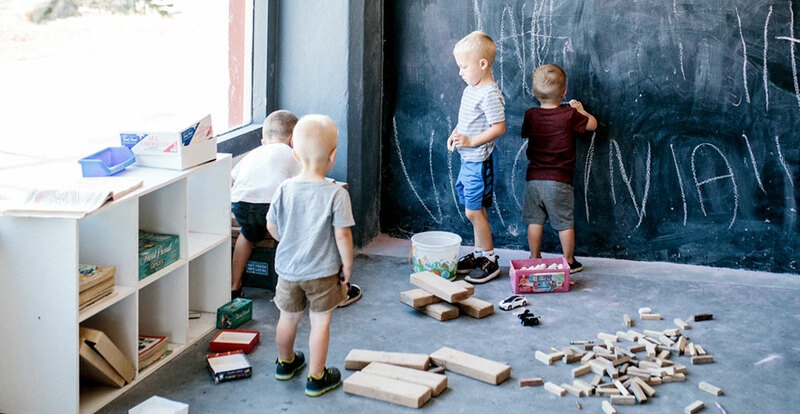 The boys had a blast drawing on the giant chalk wall while we enjoyed our beer. It was the perfect place to cool down. Once everyone was ready, we headed back out to the Greenway. After Hawksbill, we all decided we had tempted fate enough and headed to the Mimslyn Inn to put the boys down for a nap. The AC felt soooooo refreshing after being out in the heat all day. We had some snacks, chilled out, and rehydrated. We even got in a little pool time with the older boys which was awesome. I forgot to mention that this was a joint adventure with my sister-in-law and her family. In total there were four adults and four kids, ranging in age from 2-5 (the kids, not the adults, obviously). 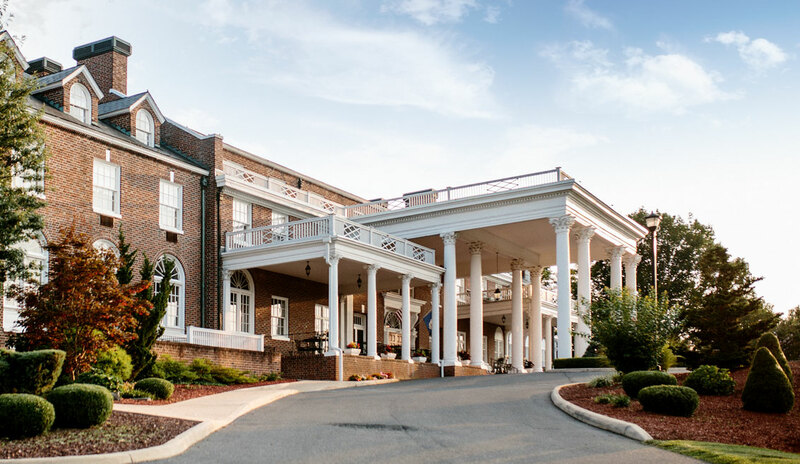 We rented The Manor House at The Mimslyn Inn. Totally worth it. The Manor House sleeps 16 people across six bedrooms with bed sizes ranging from kings to bunkbeds to a sofa sleeper and plenty of bathrooms. Like I said, totally worth it for each kid to get their own room. Today was the big day. Today was the day we were going to take the boys into Luray Caverns. They were excited. Chris and I were excited. 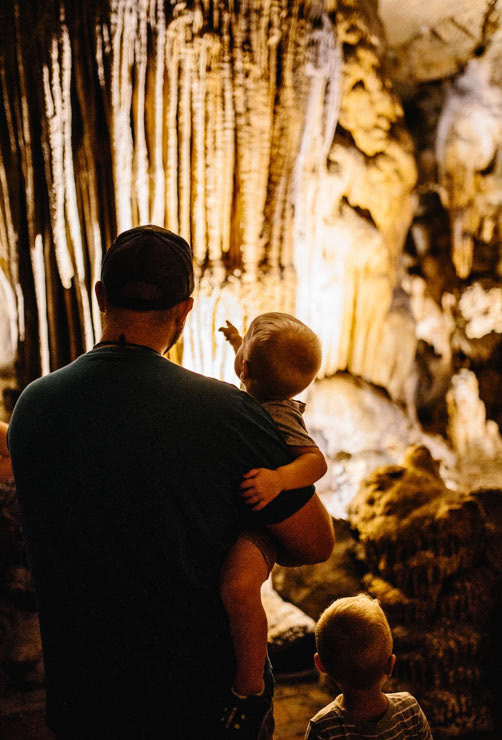 This was the boys’ first trip to Luray Caverns. Chris and I had both visited before years ago. Like almost every kid that grew up within a 100-mile radius, we took field trips here back in elementary school. First of all, the Caverns are AMAZING. The formations are awesome to see. Just nature being nature. The stalactites, the stalagmites, it’s all just amazing. Then add in this other element to it that’s hard to describe. It’s like seeing a visual of how time passes because they have taken so long to form and that just adds into the WOW factor. And it is HUGE! It wasn’t lost on the boys either, which was something we were a little worried about. With young ones, you can never be too sure if they’ll grasp just how amazing something is. I don’t know if they fully got it, but they were still blown away. They kept saying they felt like they were in another world. Oh, little minds. The tour lasts about an hour and involves a little over a mile-long walk, which is very doable. Kellen, my youngest, got a little restless towards the end but once Chris picked him up, he relaxed. I think we all loved Dream Lake the most but ask me again tomorrow and my answer will probably be different." After the Caverns we visited the Car and Carriage Caravan Museum, which is included with your tickets. It’s also located right next door which was a big plus. I don’t know who liked the cars more, the parents or the kids! The boys are into just about anything mechanical (cars, trains, trucks) and Chris is super into cars. I liked that the tour was self-guided so we could go at our own pace. It was so sweet seeing Chris walk the boys through the evolution of cars. He’d read the plaques and they would say, “OH COOL!” and then ask questions if they had them. They went back to re-read some of them if they couldn’t figure out how the cars had changed. SO CUTE! Afterwards, we stopped and got some fudge from the fudge shop that is right in the museum. I am not going to lie the fudge was DELICIOUS! HOLY COW! We then headed over to the Luray Valley Museum. They had a bible from the 1500s (Kellen asked if I was older than that because apparently he thinks I’m the oldest person on the planet) and a dog-powered butter churn! But the fun doesn’t end there. 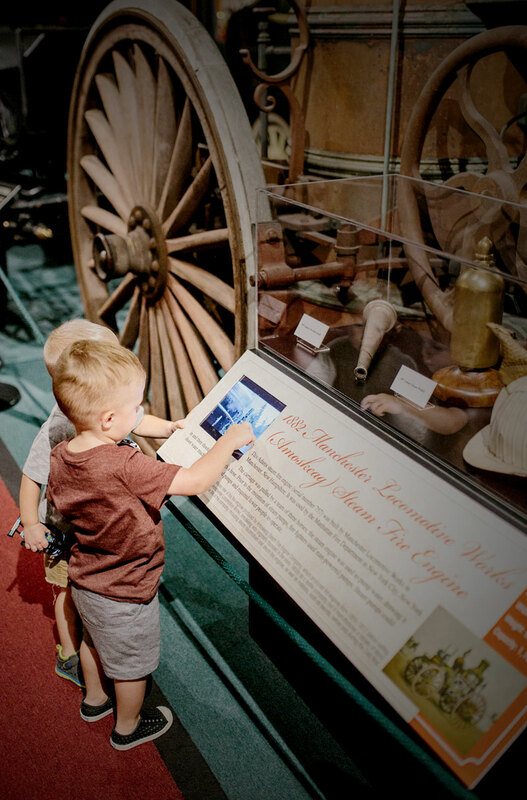 The museum isn’t just one building but an entire collection of historic buildings from around the area that were moved and rebuilt piece-by-piece. So we walked around to experience some living history. We met Mr. Fey the Blacksmith and watched him make a keychain. The boys practically did backflips when he gave it to us. 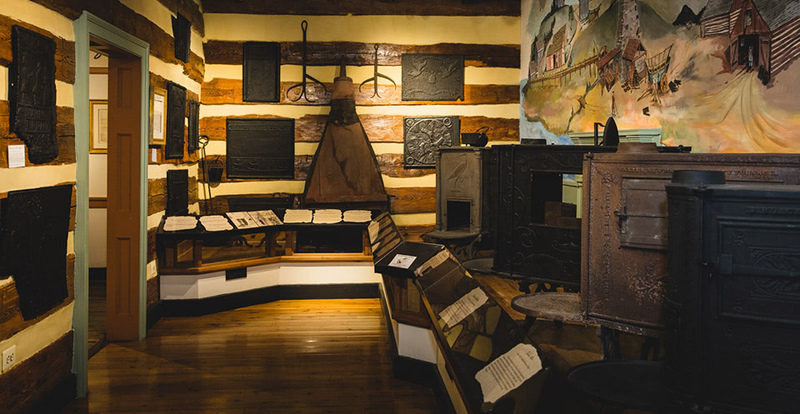 There was also an 18th-century cooking demo going on where they made donuts…from potatoes. Holy geez, they were great! They make something different every week, so there's always something new to try. The donuts got our appetites going so we popped into the Heartpine Café, located in the Burner Barn. We had some great sandwiches, some great wine (Chris and I, not the boys ), and some great views of the Blue Ridge Mountains while we recharged. When we were ready to get moving again the boys really wanted to go panning for “treasure” at the Stonyman Mining Company Gem Sluice. So we bought each of them a gem bag and had so much fun getting a hands on history lesson. The boys did get to go home with some “treasure” like quartz, amethysts and red jasper. 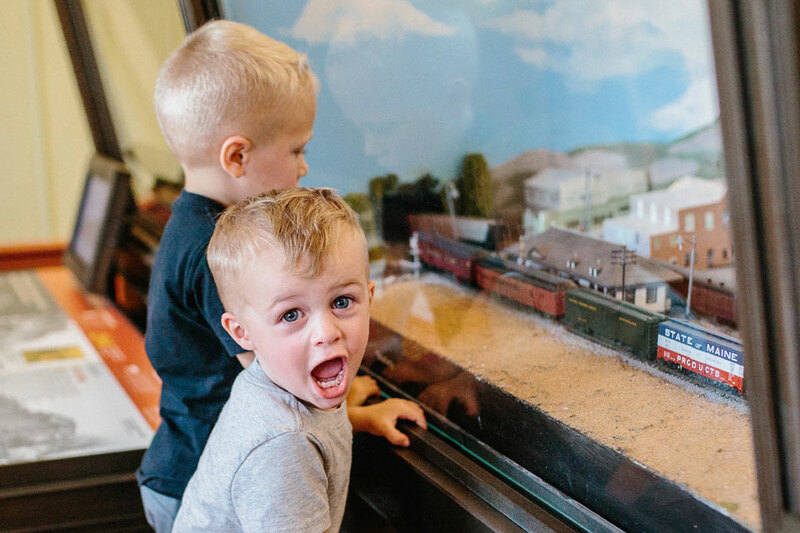 After taking a step way back in time, we headed over to Toy Town Junction. 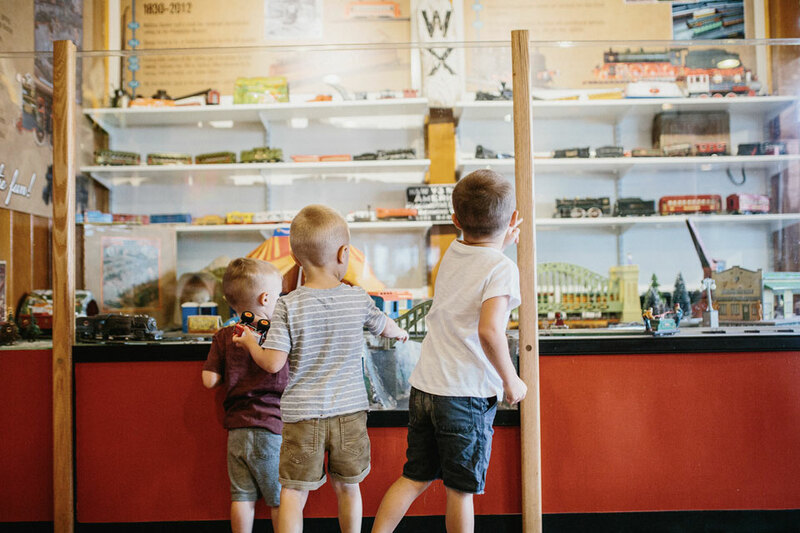 Our next stop was Toy Town Junction which is also included with your ticket to Luray Caverns. It is also located right next door to the Car and Carriage Caravan Museum. Like the name suggests, Toy Town Junction is a collection of various toys. There’s a toy train that runs around and so many toys EVERYWHERE. It was hard to pull them away, but we had made plans to do the Garden Maze. And the boys were really excited to see if they could beat me and Chris to the end of it. The race of the century was about to go down. 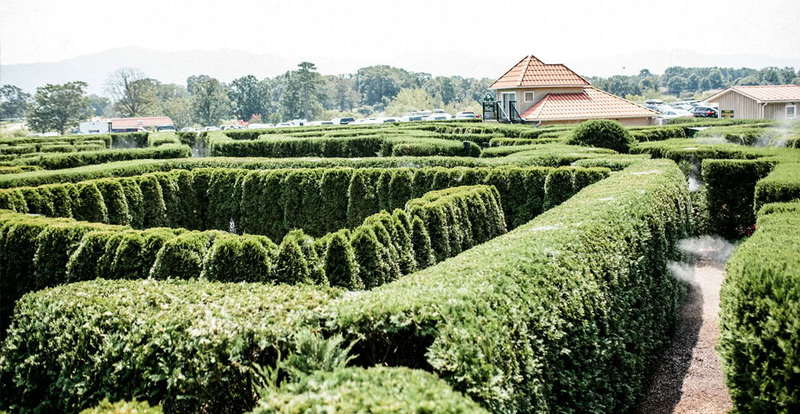 The Garden Maze was the last stop on the property. 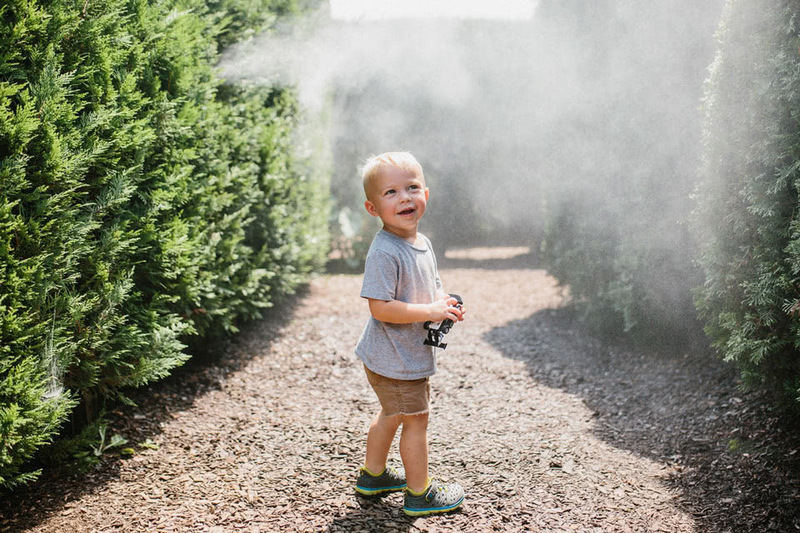 Even though it was pretty hot (I know I keep mentioning that, but seriously it was), they had misters running throughout so you got a nice, cool mist the whole time. 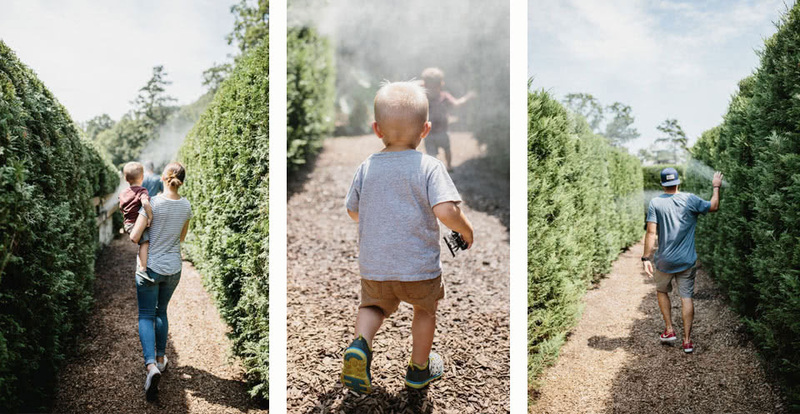 The kiddos ran around like crazy and we may or may not have lost them on occasion. But they were really enjoying the game aspect of the entire thing. I’m not going to say that Chris and I didn’t try to win, but I also won’t say that we let them win. It definitely proved that kids have a better sense of direction than adults. Or at least our kids do. We had looked online beforehand for some ice cream places we could take the boys to. 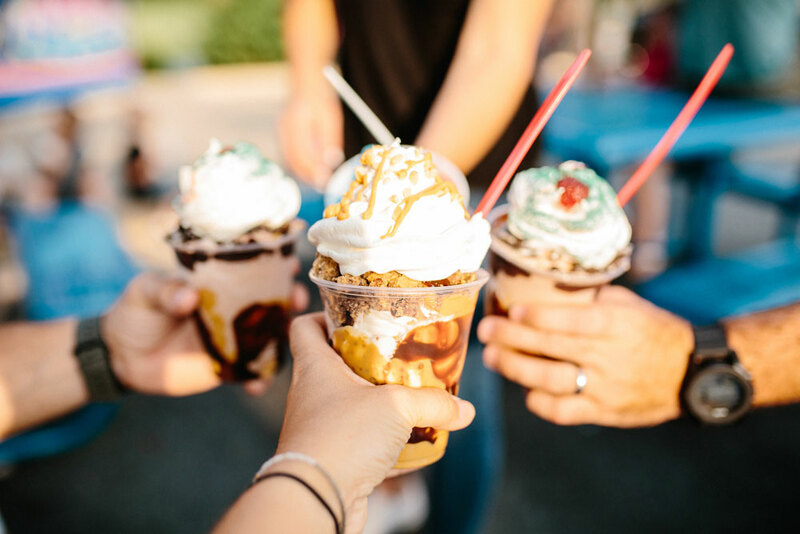 Flotzies is a local ice cream stop that had AWESOME reviews. Plus anytime you do dessert BEFORE dinner is a huge mom win. It most definitely lived up to the reviews! Not only that, but there were a TON of options. Like, almost overwhelming. I went with some cherry shaved ice, while everyone else got ice cream. The boys were talking a big game about all the toppings they were going to get but, in the end, they went with their favorites: a very simple chocolate/vanilla ice cream with sprinkles. It was the perfect way to keep everyone happy on a hot summer day. After we had recharged and relaxed, it was time for the parents to indulge in their own fun and try some of the local wine. We loaded the boys up in the car and headed out to the Wisteria Farm & Vineyard. 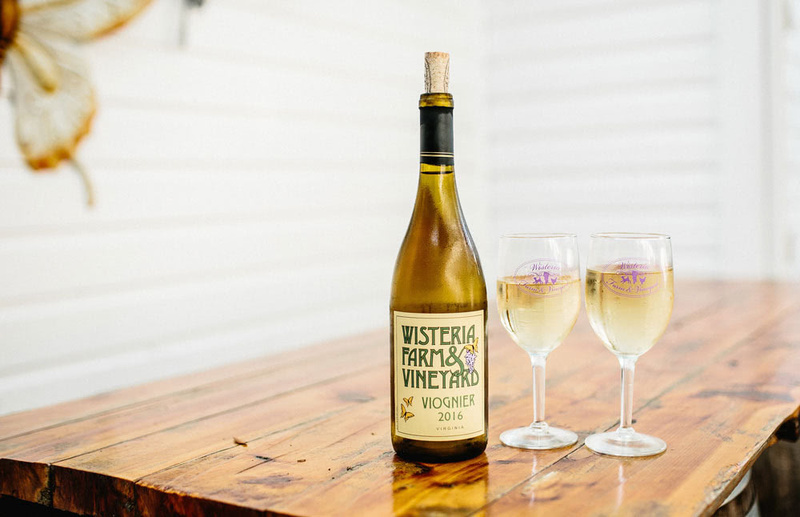 What’s cool about Wisteria is that the whole winemaking process happens right on their farm, from growing the grapes to bottling. Plus their layout and location is GORGEOUS! 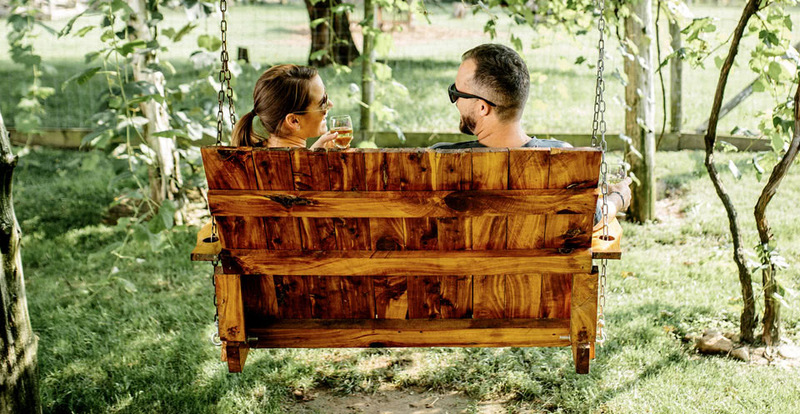 You can hang out on their porch, walk through the grapes (or run like Kellen did), or sit and swing without a care in the world. There’s even a flock of sheep and free-range chickens running around. They sell yarn and eggs from said sheep and chickens, respectively. 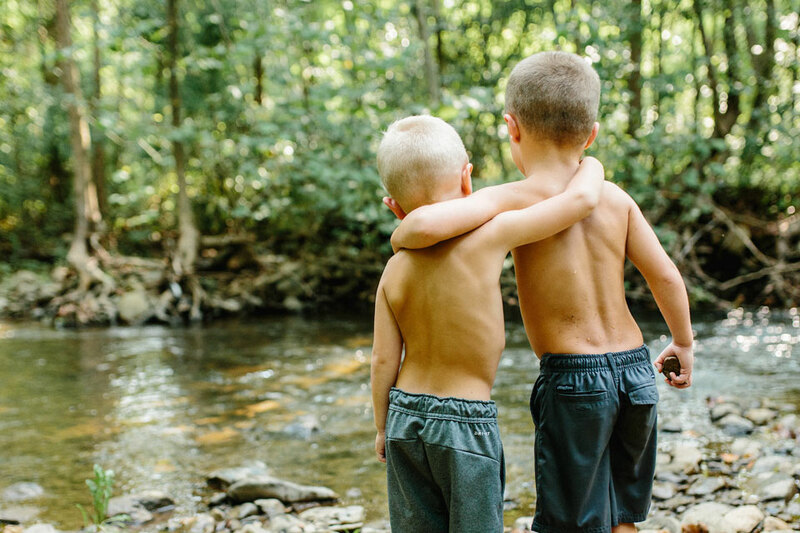 All the running around got the boys a little overheated so we took them down to a little creek at the edge of the property where they were able to cool off. Around this time, the boys became very vocal about wanting to do something other than “adult time” and that was our cue that it was time to pack up and head home. All in all, our trip to Luray was everything we could have hoped for with the boys. Everything is close enough that you can do just about anything and not have to worry about missing nap time… or pool time. And it’s so great to get away to a place where everyone is super nice without driving super far. I can definitely see Luray getting put into our regular rotation of family trip destinations. Can’t wait for next time!